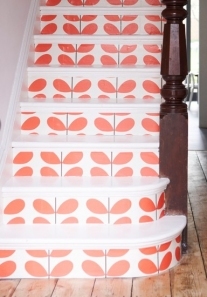 How can I make wooden stairs slip-proof? ...but we're concerned that the horizontal parts (treads) would be much more slippery as plain wood, compared to carpet. With a 4yr old in the house, and my wife being so accident-prone, I think we need some sort of anti-slip. I am not sure if it is possible to cover every single tread with a seperate piece of carpet. It might be difficult to secure the outer edge under the lip. 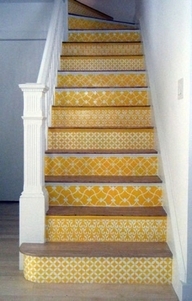 Perhaps paint each step, and sprinkle on sand/sugar whilst still wet? This would leave a textured surface, quite rough. Perhaps glue thin strips of rubber along each tread? I visited a house last week that had 4 grooves routed in each tread. It looked really good and definitely helped with your foot slipping. Also it is a better long term answer than a non skid paint. 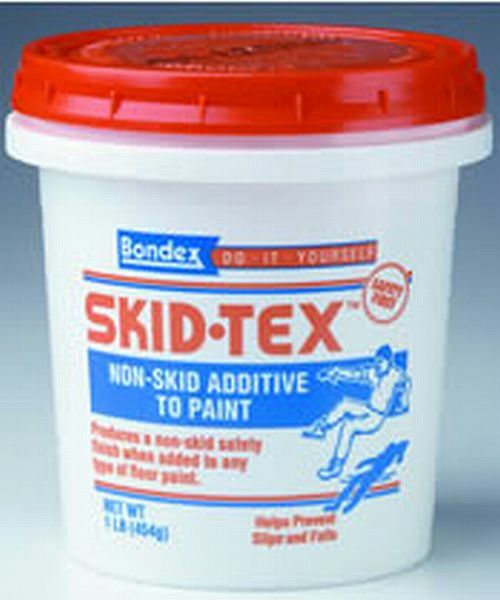 There are web sites like SlipDoctors & Noskid that offer a clear spray that has non slip properties. Don't use a furniture finish formulation, floor finish formulations already include items that provide for a higher traction finish. Adding grit is the most common solution for increasing traction; but even bothering to add grit is rare. 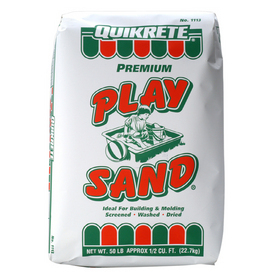 If you do opt to add grit, look into "Interdeck No Skid" which is a marine supply grit additive. There are also marine grits meant to be mixed with your existing paints. Since lots of people tend to go barefoot on their boats, marine grit additives tend to be less abrasive (and youre feet will thank you). What is your rise and run? Often a short run will have far more impact in determining if you will slip down the stairs. The grip / tread tape mentioned above also has clear plastic variants. A bit more aesthetically pleasing than the black item pictured; however, any kind of adhesive backed item is gong to ruin a finish below it and have a limited lifespan (determined by the adhesive backing, the cleanliness of the step prior to application, and humidity). Bare feet and tennis shoes tend to do well on wood stairs, it is the occasionally stocking footed person (or rarely the leather soled shoes) that are really going to give concern. 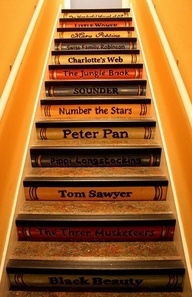 I like the picture where the stairs are designed as books, what you're suggesting will turn a staircase into a real feature. But you have to think about safety first before anything else. I'd install non-slip tread nosings as paints, coatings and tape will wear quickly. I am researching to solve this problem. I have come across Skid Guard 100 paint, rubber treads, black sandy tape, and now a clear tape that goes at the edge of the tread that is textured with 2 choices of grit and usually lasts 5 yrs. they say. At present we have a textured colored rubber runner that came from Sears years ago and it is wearing out and it is slippery when wet and a bear to scrub and keep the grooves clean. I can't find another runner. So we are going to remove it, paint steps or replace the treads. May use the idea of routing grooves, I like that idea except I can see dirt catching in there and it not feeling good on our stockinged feet (we don't wear shoes indoors). Also we had a cat who leaves hair on the steps. 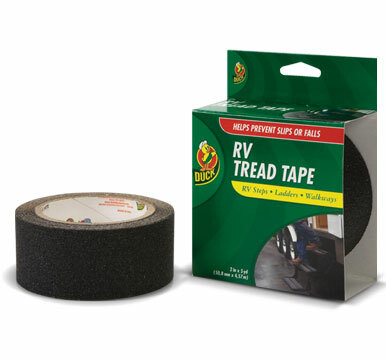 So when we have new treads or new paint we are going to use the textured transparent tape on the tread edges. Not the answer you're looking for? Browse other questions tagged paint safety stairs or ask your own question. How do I baby-proof open stairs? How can I create a platform on my stairs strong enough to support a ladder? How do I make exposed wood stairs less squeaky? Can I use composite wood to make ground-contact retaining stairs? Can I make my bulkhead stairs steeper and still be up to code? How to stabilize a wooden lawn mower ramp over stairs?